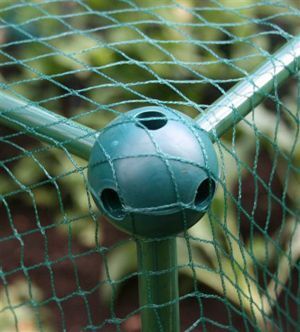 Green rubber balls with an ingenious system of holes which will take either a bamboo cane or tubing to build a diy frame. One larger 16mm hole for the upright and five 12.7mm holes for the horizontals. For the traditionalists these balls used to be known as Horti-Balls. I have not worked out how you can build a meaningful structure with less than four balls but one on its own makes a marvellous sized ball for a smaller sized dog!